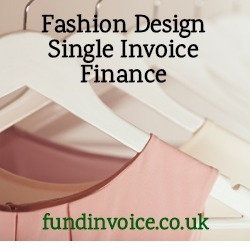 Glamorous is not how you might typically describe the world of invoice finance, but sometimes we can become involved with funding far more glamorous sectors, such as the case below, in the fashion design sector. This was a case where we were able to assist a small fashion designer that was looking for funding against a single invoice initially. I have written recently about how late payments are affecting creative sectors, like fashion design. The deal was complicated by the fact that they prime mover was in fact a foreign national living in the UK. This means that some of the well known UK funders are unlikely to want to finance such a business - therefore our client needed a specialist lender. We were able to introduce this fashion design company to a selective invoice finance provider, that can offer them single invoice funding. By its very nature, it often involves a single debtor situation, where there is only one customer. Many funders will now allow these situations, so it is a niche type of finance that is needed - and not all funders will allow you to pick and choose the invoices to be funded. This client opted for one of many types of invoice funding that are explained in our free guide. The selective nature of the facility means that they are not locked into providing all their invoices for funding, and they can choose to use the facility whenever their cash flow requires an extra boost. In addition, they have a factoring style arrangement so that they will also receive a credit control service for their funded invoices. This means that they won't have to do the credit control and chasing themselves. This is sometimes called spot factoring. The flexibility with type of arrangement is that the client can use the facility as and when they choose, without being locked into any minimum turnover levels. As the business grows, they may choose to make more use of the funding as it can be an ideal way to finance the growth of a company, where other forms of finance e.g. overdraft, do not grow in line with turnover.